I have things to say…updates, reviews, notes on 10K training…but for right now, I want to get my May challenge up so everyone can play along! It’s leg month, so get ready to work. If you want to join in with a group for accountability, let me know and I’ll add you in! I tried a new recipe (if you can call it that!) yesterday and it came out wonderfully! I’m a little worried for the kale that’s in my fridge because these are high on my make again list. 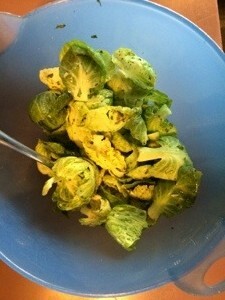 I started out by removing the leaves from the Brussels sprouts. I chopped off the ends, removed some leaves, chopped, removed, and on and on until I could go no further and moved on to the next one. 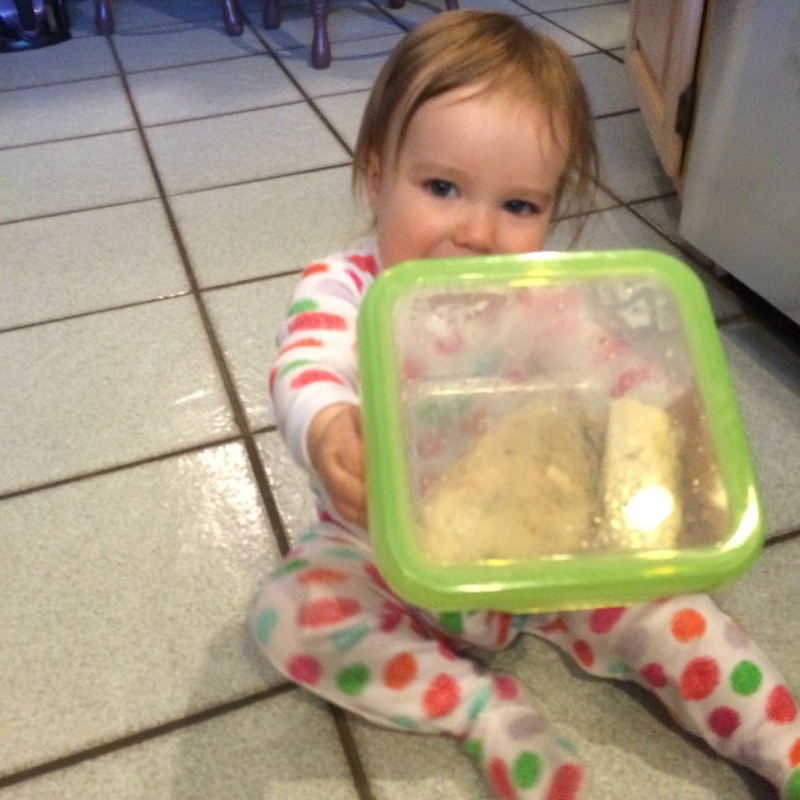 I measured in my green 21 Day Fix container, but you can make more. Then, I added 1t of olive oil (as that was my plan for lunch) and the 21 Day Fix Mediterranean seasoning and mixed to coat. Then it was onto the sheet and into the oven! I had preheated to 350…well almost preheated! I would put them in for 10 min, but since I didn’t fully preheat, I put them in for 13 minutes. They came out deliciously crunchy! So good with my lunch yesterday. I think these are a new staple for me. 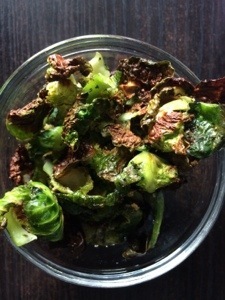 I’m glad I picked up a good amount of Brussels sprouts so I can make more! 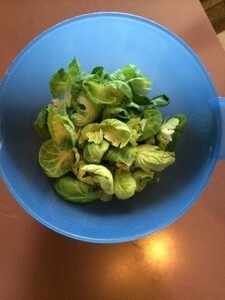 Remove leaves from Brussels sprouts and put in a bowl. Add oil and seasoning. Mix to coat. Spread on a baking sheet. 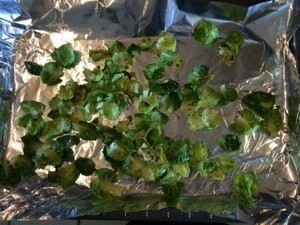 Put in oven for 10 min or until leaves begin to brown. Some people think I’m a bit nutty for planning exercise on all days. But hear me out. I know when I have about 50 min to workout on Monday-Friday. I find ways to plan for it on the weekends. Some days, it’s a little yoga (I don’t go hard every day!) and others it’s (literally) Insanity. But making the time daily creates the habit that I need. When first introducing exercise to your life, that habit is what you need to make the motivation last. And now that I have the habit, I keep it going for a few other reasons. How often do you need to skip a workout and it slips later and later in the day until you just can’t do it? If you plan to workout daily, this isn’t a huge deal. You can call it a rest day, and move on to your next day. It forces you to include active rest/stretching/yoga in your plan. You can’t go crazy every day! You’ll burn out, it isn’t good for your body and you’re ignoring flexibility training if you do. Work that into the schedule. I prefer to choose rest days if I take them. When I planned out rest days, some days I didn’t need them, other days I had planned for I really did. This lets me take the days when I feel it is needed for my body. How often do you exercise? Do you plan it out on a calendar or app? I just added a new page, where you can apply to participate in my next challenge group. What are challenge groups about? Access to me at (almost) all times, daily pushes, a group to help keep you motivated and tips for healthy living. Usually, I start up two groups a month, a large group doing a little extra arms, legs or abs and a smaller group of folks on a program. This application is for these smaller groups becasue I only accept a few into each. I like to keep those small so no one can fall through the cracks. I have my next group planned for 4/28. I also have agroup for the 21 Day Fix that is always open! If you want more information, or want to do a group while taking advantage of the April sales, fill out the application and we can chat! I’m sitting still now after a busy busy day. 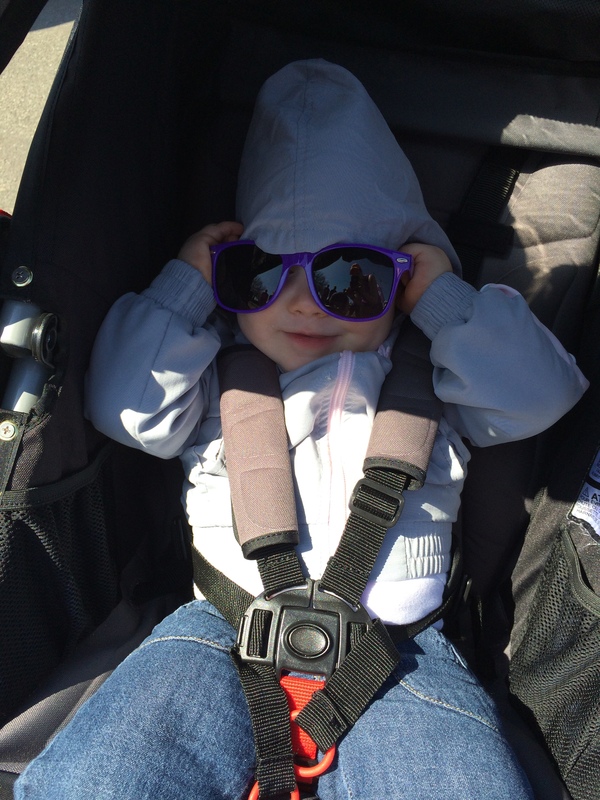 I packed the early part of today with activities we wanted to do…there was just too much going on today! It worked out pretty well and we had a good time. First (after packing 3 bags for the day!) was our Moms in Training group run (donate here!). We did 50 minutes today and it felt good! Most of my Saturday long runs are now “the longest run since I found out I was pregnant” as I ran 4 miles the day I found out and then it was two on a good day! I did a 5K in there too, but I can’t remember if I ran the whole thing (I did come in with a better time than expected). I had some quad pain during Friday’s run, so I was a little worried. It did hurt a bit a little after, but was fine during. After that, we went to the gym where I could shower while my sidekick played. It was better located than home and I was able to be quick without a buddy. I try to bring her to the gym child care pretty often to get her more used to it. So this was a nice short visit where she had a good time. After that, we swung by her school quickly. Then was the big fun…an hour in traffic! Just kidding. But we did spend that long! I started breaking lunch out of the bag while we were stopped. 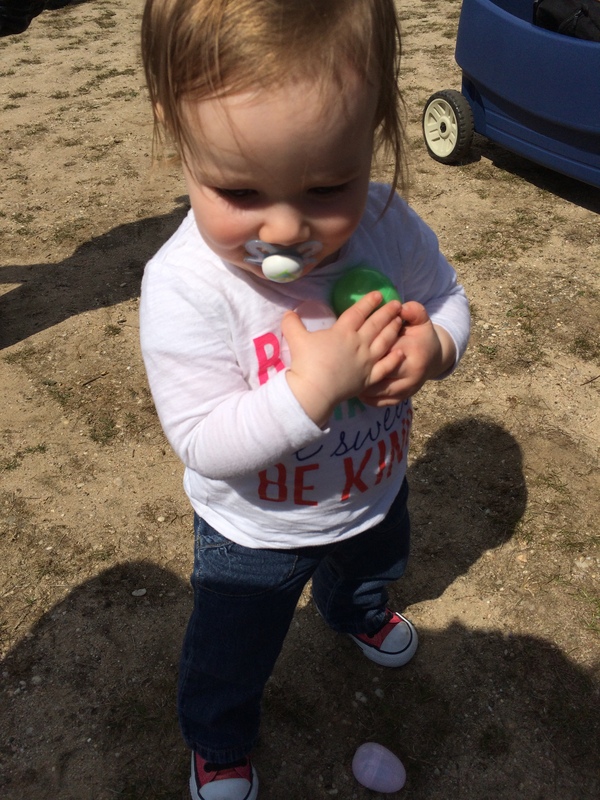 We went to an Easter egg hunt where she held all the eggs she could. Kids are cute. It’s so fun watching them play. Can you guess that nap time was next? All this and we were home about 3. I needed a nap just as much as she did! But it was a great day, mostly outdoors, enjoying the nicest day in months! Did you enjoy some nice weather today? What was on your schedule? Apparently, I didn’t press the GO button last night. So pretend it’s yesterday because now it actually IS Tuesday! Happy Monday…I thought it was Tuesday for a moment! I ate out tonight, so I figured I would write a bunch of the food I’ve eaten out on the 21 Day Fix. Next was sushi. I usually do sushi with no rice, like a naruto roll. Then I get a small salad with it, either with oil and vinegar or bringing my 21 Day Fix dressing. If I have a yellow or two, I will get a sandwich with some sort of meat and mustard. Or I’ll have some baked sweet potato fries with my salad. For breakfast, it’s easy to find eggs or oatmeal, so that’s great. And fruit is easy to find on the go. I think that vegetables are the hardest on the go. It’s kind of salad or carrots! What are your on the go ideas?